The Largest Effort Ever to Focus on Black America | I’m honored that I was contacted by the Prostate Health Education Network to help publicise their health initiative this year. Read the information below and pass it on to others in the African American Community. The Prostate Health Education Network (PHEN) is launching its “Fifth Annual Father’s Day Rally Against Prostate Cancer” with an ambitious goal of reaching one million persons. This will be the largest and most visible prostate cancer education and awareness effort ever undertaken with a focus on Black America. The Rally will be held on Sunday, June 16, 2013 in partnership with churches nationwide during their regular church services. Prostate cancer survivors within each congregation along with family members of those who have lost loved ones to the disease will be recognized and join hands in prayer for healing. In 2012, The Rally reached approximately 200,000 persons based on the total membership of the churches that participated. 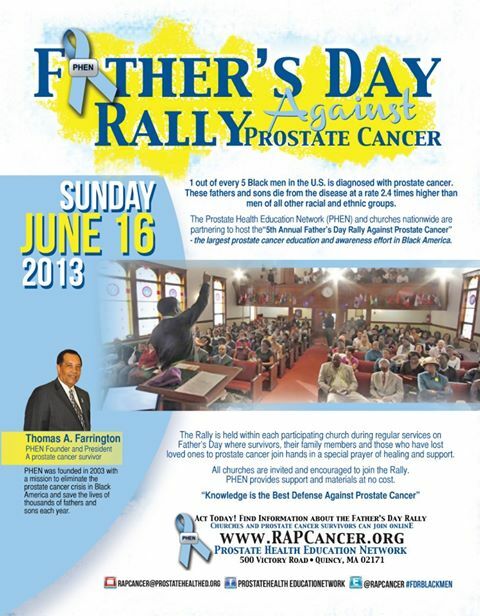 This year, PHEN will augment the Rally with prostate cancer educational symposiums in selected cities on the Saturday before Father’s Day (June 15th). The symposiums will be hosted by a church partner within each city serving as a magnet site. PHEN industry partners, members of its national survivor network, and local health providers will play integral roles in these educational activities. “PHEN’s Annual Father’s Day Rally has proven to be an effective education and awareness outreach initiative for African American families who are the ones most impacted by prostate cancer. Because of these urgent needs, it is imperative that we build on our success and increase outreach efforts this year,” said PHEN founder and President Thomas A. Farrington. Church partnerships which have been developed and nurtured across all denominations are the key to PHEN’s Father’s Day Rally success. “Congregations within the African Methodist Episcopal (AME) Church have actively participated in the Father’s Day Rally since its inception, and we look forward to participating in the Rally’s expansion in size and scope this year,” statesRev. Natalie Mitchem, Executive Director of the AME Connectional Health Commission. The AME Church has a membership of approximately 3 million persons within the United States and around the world. Black men die at a rate 2.5 times higher than men of all other ethnic and racial groups in the United States. This disparity led the US Senate, in July 2012, to pass a resolution recognizing prostate cancer to be of epidemic proportions among African American men. However, there has been significant confusion among the public caused by the ongoing debate about PSA screening and over-treatment. Simultaneously, a number of new prostate cancer treatments have been approved and there is a flurry of clinical trial activity that will undoubtedly lead to more treatment breakthroughs along with new procedures for detecting and managing prostate cancer. “We recognize the enormous challenge in achieving our Rally’s goal this year, however, Black America must become knowledgeable about new developments and fully engaged in order to eliminate the current epidemic, and not be overlooked and risk a worsening condition. The Rally’s success is a significant opportunity for forward progress.” states Farrington. All churches nationwide are invited to partner with PHEN by participating in the “Fifth Annual Father’s Day Rally Against Prostate Cancer.” Church registration is now open. To register and for additional information visit: http://www.prostatehealthed.org/churchregister2013.php. Prostate cancer survivors play a crucial role in the success of the Rally by mobilizing their churches and communities around this effort. PHEN is appealing to all prostate cancer survivors, and their family members, to join in to support and help lead the Rally in meeting its one million person goal. All are invited to join the PHEN Survivor Network. About PHEN | PHEN was founded in 2003 by Thomas A. Farrington, a prostate cancer survivor and author, with a mission to eliminate the African American prostate cancer disparity. PHEN’s ongoing initiatives include: Monthly support group meetings and webcasts, an “Annual Disparity Summit” on Capitol Hill in Washington, DC, an “Annual Father’s Day Rally Against Prostate Cancer” in partnership with churches nationwide, Monthly E-newsletters on prostate cancer treatments and Clinical Trials, and a PHEN online Educational Television Series.